Stress and hair loss appear to be strongly linked, at least as a popular conception. But is there any truth to it? And if so, what can you do to reduce stress and its effect on your hairline? In this article I’m going to argue that stress can cause hair loss, and I’ll highlight the scientific proof. I’ll then look at the most effective ways to combat it. I’ll show you some powerful techniques that when used consistently, work as a powerful way to protect your hair. Does Stress Actually Cause Hair Loss? Hair loss is a complex problem, and there are many factors that play a part. These include genetics, environment, overall health and wellness, diet, and lifestyle. Let’s look more closely at one of the above factors, lifestyle. There are many facets that contribute to your lifestyle. These include how often you exercise, whether you smoke or drink, and how much stress you experience on a regular basis. An interesting thing to point out is that all of the above facets have one thing in common: they play a large role in your body’s oxygen levels. But how is stress linked to oxygen levels? Breathing has been shown time and again to have a positive impact on stress levels. More specifically, controlled breathing practices can reduce stress and anxiety, and assist in mood regulation (1, 2). An interesting explanation for why this happens is “the close structural connection between respiratory regions and neurons within the amygdala complex”. This means an improvement in respiratory usage can reduce stress levels and regulate moods via biological mechanisms. However, the practice of purposeful breathing exercises can also have a more obvious effect: increased oxygen intake. How does this relate to hair? The hair follicle and dermal papilla need adequate amounts of oxygen to survive. One of the dermal papilla’s must important roles is its connection with the blood capillaries of the scalp. These deliver blood to the hair follicles, which in turn delivers oxygen and vital nutrients. The Dermal Papilla Cells (DPCs) are then able to deliver these crucial components to the other parts of the follicle. But what happens when this blood supply is lessened, or even cut off completely? In individuals with AGA, a process known as miniaturization occurs. It happens as a result of the presence of DHT in the follicles, and it leads to inflammation and irritation (3). As the inflammation increases, the dermal papilla is cut off from the blood capillaries. This first occurs slowly, so that only some blood flow is possible, but it can soon turn to complete lack of blood supply. When this happens, the follicle is unable to sustain itself and dies. As you can see, oxygen plays a big role in the health of the scalp and hair. The more stressed you are, the less oxygen you take in as a result. This may be due to a decrease in physical activity, or perhaps an increase in shallow breathing with a simultaneous decrease in deep breathing. Whatever the cause, the decrease in oxygen will have a negative impact on the follicles. This can be even worse for individuals with already inflamed hair follicles who need all of the oxygen they can get. In short: It’s crucially important to maintain good circulation to the hair follicles so nutrients, oxygen, and hormones can enable growth. Without them, or with restricted flow, the hair follicle growth phase becomes shorter and the resting phase becomes longer. While oxygen plays a major role in the health of the hair follicle, there are other factors which contribute as well. One of those is the presence of inflammation, which was briefly touched on above. Inflammation occurs for various reasons, and it can be short term (acute) or long term (chronic) (4). The most common causes of inflammation include injury, illness, and exposure to allergens (4). Are you unconvinced that stress can trigger inflammation within the body, and therefore lead to hair loss? Let’s take a look a 2017 study which studied this very issue (5). Previous studies have shown that stress can enhance neurogenic inflammation and induce adaptive immunity cytokine-imbalance (6, 7). With this in mind, German researchers have looked to understand whether naturalistic life-stress exposure affects cytokine balance and hair growth in healthy individuals (5). First, it’s important to understand cytokines and the role they play in inflammation. Cytokines are pro-inflammatory substances that are released by immune cells in response to injury, illness, or foreign attack (such as an allergy) (8). These substances include the proteins interleukin 4 (IL-4) and interleukin 10 (IL-10), as well as growth factors. One of the easiest ways to ‘diagnose’ inflammation is by measuring the levels of cytokines present. In this study, researchers recruited 33 female medical students. 18 of these students were in the midst of exams, while the other 15 were simply for comparison. 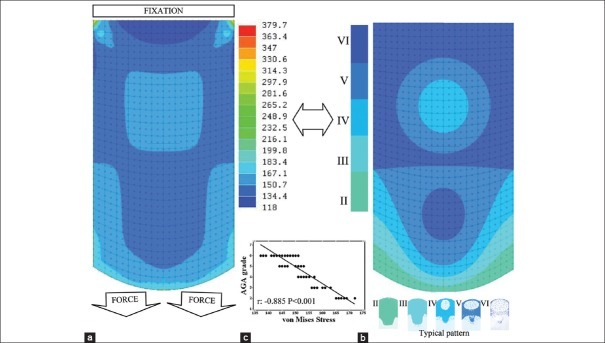 Trichogram (hair cycle and pigmentation analysis). T3 – after 12 weeks of rest following exam period. As the study revealed, there was a noted increase in stress perception in exam periods at T2 in the 18 students who were in the midst of exams. Perceived stress levels remained the same in the control students at this time. 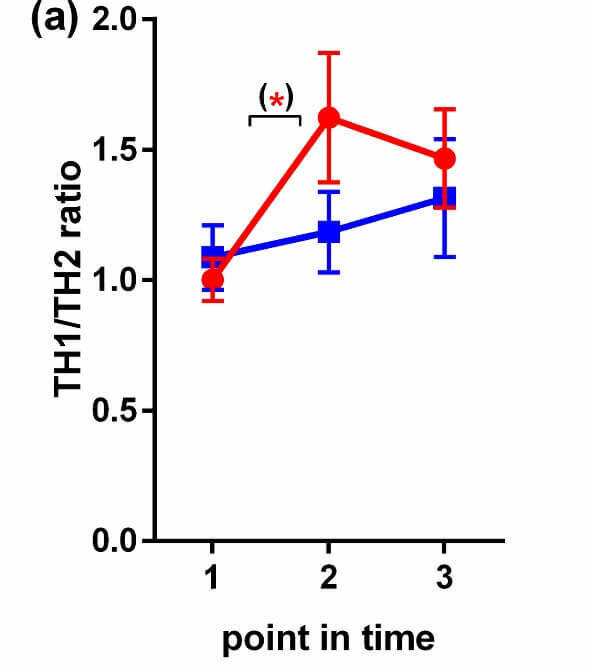 As shown above, the ratio of TH1 and TH2 cytokines increased in exam students (red) in T2 when compared to their non-exam counterparts (blue). This indicates that stress levels induced the increase in TH1/TH2 ratios. Even more interestingly, the TH1/TH2 ratios had not returned to that of their non-exam counterparts even 12 weeks after the exam period. This indicates that stress, even short term, can have long-term biological effects. But what about hair loss? The participants’ hairs were plucked (100 in all) and analyzed by two different investigators. The hairs were analyzed for current stage of hair growth, and pigmentation was also noted. 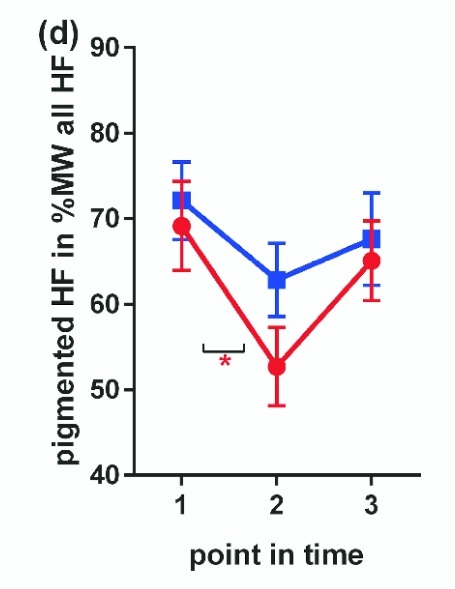 Reduced pigmentation of the hair tip (which is not affected by dyes) is an indicator of transgression from anagen (active) to catagen (rest) phase. 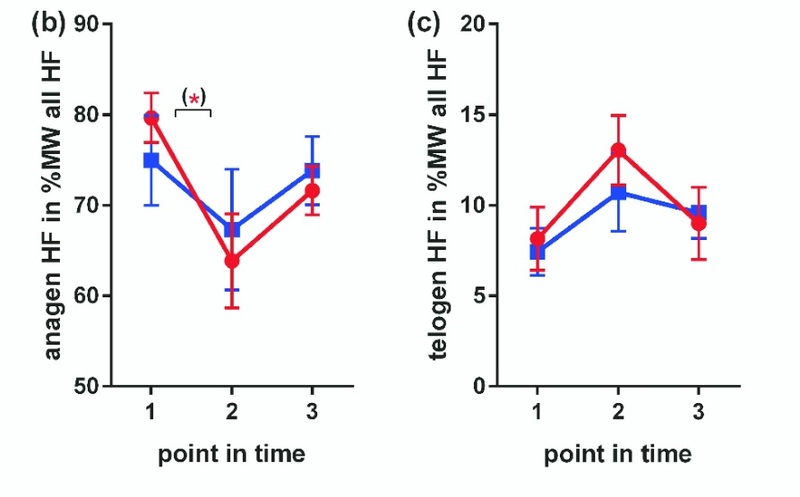 As shown above, the exam students (red) saw a decrease in anagen phase hairs and an increase in telogen phase hairs during T2. The exam students (red) saw a decrease in pigmentation during T2, which indicates a transgression from anagen to catagen phase. This puts an end to active hair growth. In summary, periods of stress can have a biological impact (a change in cytokine ratios) as well as physical (an end to active hair growth). This strongly suggests that stress can have a direct role in hair loss during prolonged periods of time. Stress & Tension: An Additional Theory? While I do believe low oxygen levels contribute to stress-induced hair loss, there’s evidence that another mechanism is at play: tension. According to Rafael Tellez-Segura, there are five layers of the scalp. From outermost to innermost, they are: skin, subcutaneous, galea, subgalea, and pericranium. Mechanical forces pull the galea downward, which mimics the typical pattern of balding. Source. But is it true that stress is linked to increased muscular tension? Yes – this was shown to be true multiple times, such as in a 1994 study that showed emg activity of the trapezius muscle, and again in 2010 in a paper that linked psychological stress and tension-type headaches (11, 12). So, what is it about tension that does this? There are a few theories, though perhaps the one to make the most sense is that which discusses the protein Hic-5, an androgen receptor co-activator which improves the function of a cell’s androgen receptors. This protein has been previously shown to induce androgen sensitivity in hair follicles (such as that seen in AGA) (13). And this latest study shows that it may be triggered by mechanical stress (14). In short? Tension (as a result of stress) can activate Hic-5, which then induces androgen (e.g. DHT) sensitivity in the hair follicles. If you think about it, this doesn’t seem so far fetched. After all, the parts of the scalp affected by pattern hair loss are over the galea (i.e. the hairline and crown). So, what does this mean for stress? Stress, which has been shown to trigger tension, can activate the Hic-5 protein which then increases androgen sensitivity. You must then, find a way to reduce stress levels if you have any hope of preventing further loss and regrowing your hair. What Can You Do to Reduce Your Stress Levels? Many men are initially skeptical about how breathing could prevent hair loss and aid in its regrowth. I don’t blame them, but once they see that just like smoking and air pollution can heavily contribute to hair loss, breath control is the immediate remedy and produces the opposite effect. In Eastern literature breathing is the single most important aspect of health regimens. Some rather more esoteric Eastern literature has linked shallow chest breathing with premature aging and baldness since breath drives ‘chee’ through the body’s ‘energy channels’ without which energy stagnation and insufficient blood circulation occurs. This, it explains, can lead to the contraction of the hair follicles, restricting new hair, and preventing thick and strong hair from growing. And while this may seem like folk medicine, there is proof that deep breathing practices can reduce stress levels (1). Practicing breathing techniques each day is known to activate the parasympathetic nervous system which flips on the ‘rest and digest’ side of the body and turns off the ‘fight or flight’ side (15). 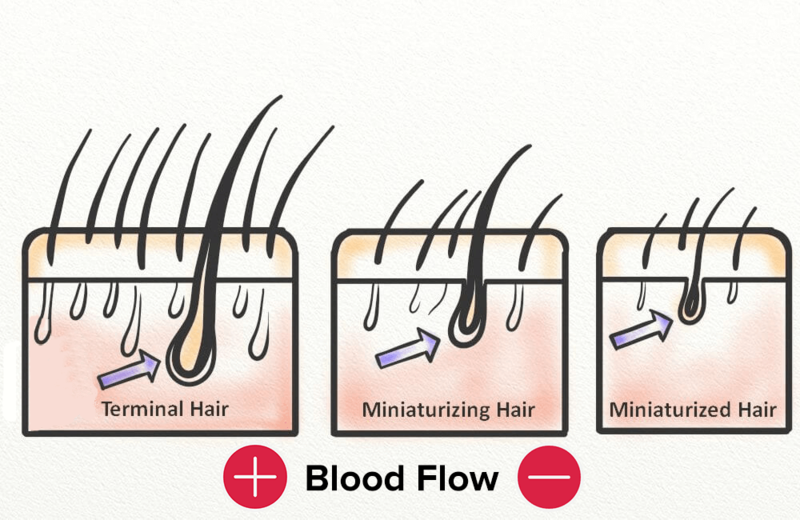 The most effective techniques to promote hair regrowth through enhanced blood circulation are described below. This technique is called being breathed because it feels like the earth is breathing for you. The idea is to focus entirely on the exhalation stage of the breath cycle; this completely purges the lungs of stagnant and stale air providing a cleansing affect. Start by contracting the lower abdominals, then move up past the navel to upper abdominals, lower, and upper chest. Contract inwards, expelling as much air from the lungs as you can. Once you’ve exhaled all the air, relax the muscles in the reverse order of exhalation (i.e. starting with the upper chest and finishing with the lower abdominals). Only make a little effort to inhale, and put focus primarily on relaxing and allowing the air pressure to breath for you. This is the opposite of how most people breathe normally, which leaves a continual volume of air in the lower regions of the lungs, where the alveoli are the most abundant. Without full exhalation the majority of alveoli are exposed only to stale air which is lacking in oxygen and negative ions, but high in carbon dioxide and positive ions (which are the bad ones). Thus, much more oxygen can be absorbed and carbon dioxide expelled if the lower abdominal region is used in breathing. The overall affect is that carbon dioxide is expelled from the blood at a much quicker rate, providing an instant cleansing feeling. Unlike the ‘being breathed’ technique which is excellent for removing carbon dioxide and cleansing the bloodstream, abdominal breathing focuses more on energizing the system and maximizing blood circulation. It’s best to practice a bit of both. And whereas ‘being breathed’ emphasized exhalation, abdominal breathing is about inhalation, retention, and exhalation. For this exercise, standing is best. Inhale slowly from the lower abdomen, into the chest, and finally the clavicles. You want to fill the lungs to about 90% of maximum, but if it feels uncomfortable then you’ve gone too far. Whilst inhaling try to visualize the air stream flowing through the nostrils deep into the lungs. As the lungs reach capacity sink a ‘bubble’ of air as far down into the lower abdomen as possible. This basically means visualize the air sinking deep into the lungs where the most alveoli are present. Retain the breath for 3-5 seconds but if you have to expel air quickly shorten the retention time until it’s comfortable. Keep the breathing pattern smooth and rhythmic. The exhalation is very similar to the ‘being breathed’ technique. For added efficacy, raise the arms in an arc as wide as possible on inhalation and lower on exhalation whilst standing. For the breathing techniques to affect hair regrowth they must be practised daily for at least a month. A combination of the two techniques each day for ten minutes will work wonders. It will directly affect hair regrowth by massively increasing blood circulation throughout the scalp which helps to dilate and nourish hair follicles. Indirectly, breathing corrects bioelectric imbalance, relieves stress by activating the parasympathetic nervous system, reduces autoimmune response from allergic reactions, and stimulates the secretion of vital youthful hormones, all of which have been proved to reduce hair loss and promote new hair growth (16). Oxygenation of the blood is also highly conducive to the alkalisation of the blood. Alkaline and oxygenated blood are found together, whereas acidic blood full of carbon dioxide also support one another. Therefore practicing breathing techniques will help to alkalize the blood. Another reason to perform this breathing exercise is to relieve stress. The connection between stress and hair loss is fairly well known, but most people fail to understand that breathing is the link that connects them (5). Stress automatically causes shallow chest-breathing, just watch anyone who’s in a highly stressful situation to see how this is true. But for a lot of people and particularly those who suffer hair loss, the stress in on-going. It doesn’t peak and then subside like it would in natural settings (which would provide therapeutic benefits), but is actually maintained at a high level by our modern lifestyles. This is where the real damage is done because it leads to shallow chest breathing 24 hours a day and chronic oxygen deficiency. So the remedy is obvious. Deep diaphragmatic breathing techniques practiced daily. The best time to perform this exercise is upon rising in the morning or before bed time, but anytime at all is good. Performing ten minutes of this breathing exercise before bed not only endows the individual with countless health benefits but will also reduce the number of hours of sleep needed by one hour. Does this all seem too good to be true? Remember that mindful breathing is really just a form of meditation. And meditation has been linked to stress reduction (17). Another important point to remember about relieving stress is that, ‘we unconsciously tense, so we must consciously relax.’ This means taking two minutes every day (before you fall asleep is ideal) to consciously relax every muscle in your body. Start with the facial muscles and work your way down your body being conscious of relaxing each muscle in turn. I also have to remind myself every day not to worry about the things I have no control over, but to take action on the things I do. As mentioned above, low oxygen levels aren’t the only reason that stress can induce hair loss. Another major factor is mechanical stress, or tension. So, how can you hope to reduce tension? With yoga! Yoga is an ancient practice which has proven benefits. These include improving self-perception and attention, increasing flexibility and endurance, and even treating the symptoms of depression (18, 19, 20). But most importantly as it’s related to hair loss, yoga has also proven effective in reducing tension and treating chronic pain (21). This means that regular yoga practice, especially in combination with meditation or other deep breathing exercises, can help to reduce stress levels and lower tension throughout the body (22). To get started with a yoga practice, you don’t need much. A membership to a yoga studio would be nice, but that’s not necessary either. All you need is an exercise mat, and a bit of basic instruction on yogic practices. You can commonly find yoga instructionals online, or even a library book will do! It’s most important that just like with deep breathing, you’re consistent with this practice. This will yield the greatest results, both for your body and your hair. Now, please allow me to get a little weird! The first time I heard about the following ideas in some esoteric eastern literature on yoga and tantra, I was skeptical as well, but the reality is the results speak for themselves. Whether it’s weird or not is irrelevant to those who will do what it takes to get the results. Look around you at your fellow men suffering from hair loss and you might start to notice that the majority of them have pretty poor posture. It might seem like they are ‘resting on their bones’ even when they’re standing, instead of using their core muscles to stand erect. This ‘resting on their bones’ syndrome inevitably leads to very bad posture. The spinal column becomes misaligned, and the core muscles atrophy. In yogic literature when the spinal column is bent out of shape the body’s bioelectric energy tends to stagnate, and associated problems arise. When bioelectric energy stagnates and fails to reach the whole body, symptoms of illness start to appear. When an animal is hurt or in danger, their entire body will tense up. A joke, that when someone is scared is to ‘assume the fetal position’ which is basically being cowered up in a ball. Well the same thing happens in reverse. If your shoulders are hunched over, and your spine is bent, your body feels in protective mode. This makes us feel tense, and from tension comes stress (23). 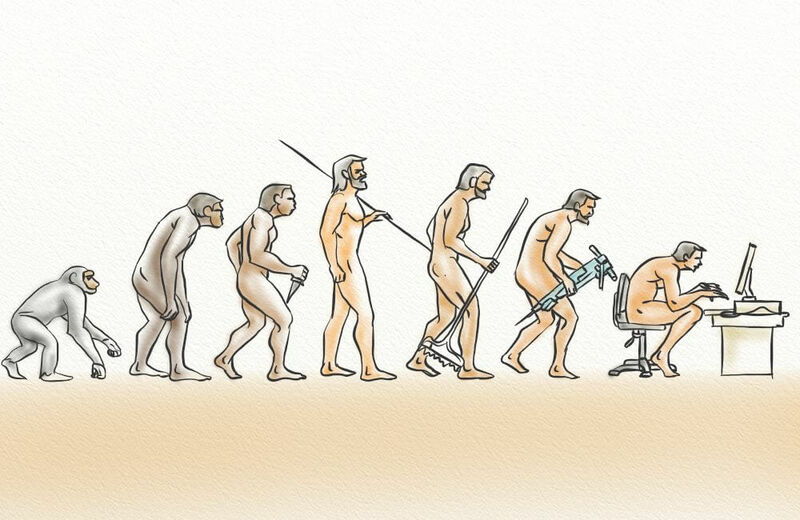 Do you see how poor posture leads to stress on a physiological level? For us, hair loss is our main concern, and so the upper spinal column is the most important area to focus on. When the upper spinal column is in proper alignment energy flows with ease up into the cranium providing ‘direct nourishment’ for the head and scalp. And if the tantric aspect of this doesn’t appeal to you, just consider the study above which linked tension with hair loss. We must therefore act to bring the spinal column back into its natural alignment to maximize the amount of blood flowing into the scalp, as well as relieve tension. It requires a fairly long time to realign it because of the amount of time it took to get there, and requires daily ‘exercise’ or stretches to do so. 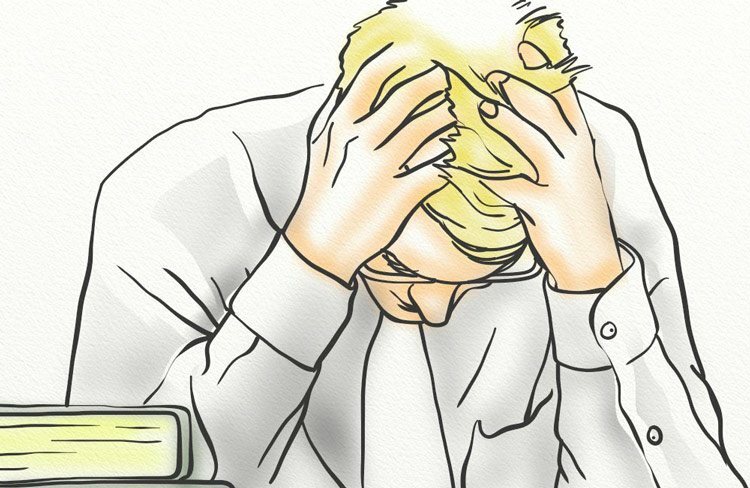 Stress is a common part of the human condition. However, it’s presence can result in unpleasant physical and mental changes. One such change? Hair loss. With the link between stress and hair loss clearer, it’s important to be sure you’re addressing your stress appropriately. This means introducing breathing practices into your daily routine, and learning how to let the smaller things go. And if stress is a regular part of your life? Then some changes may need to be made – such as a new job, or new living situation – so as to reduce stress levels significantly.